Morocco is quite the destination for families to escape to. It can be aptly described as ‘otherworldly’ for its mysticism and beauty. The small town of Chefchaouen is especially popular amongst families as a tourist destination. Located in the Rif Mountains, almost all the houses in the town are painted in white and blue, making it stand out from its surroundings. Other than the color, the town has plenty more to offer. Popular activities include taking baths in the pristine mountain streams, going for a hike on the hills or simply taking an idle stroll. The local cuisine is also quite a hit with the visiting tourists. Chefchaouen also has many options for shopping. Gorillas, just like humans, are social animals. They often live in family-like set-ups. A lone silverback gorilla can be the leader of any one such family. Take your family to meet one of these gorilla families at the Bwindi National Park, which is home to almost half of the mountain gorillas in the world. The best time for visiting the park is from the months of June to September. If you go during the off-season, you will face intermittent rains but the ticket prices will be cheaper. December to February is also a good time for visiting the park as the weather is slightly cooler. Everybody has heard of snowboarding. Now, you can also go for sand boarding! The Namib Desert is home to some of the largest sand dunes in the world. If you find that to be to be too adventurous, then you can go for a simple horse ride through the desert. Or you can also go for quad biking. Once you are finished with the desert, you can visit Cape Cross for seeing the cute Cape Fur seals. The region is also known for its cuisine, so do not forget to enjoy a delicious seafood meal with your family. The Okavango Delta was created by the Kavango River, which originates in the highlands of Angola. This delta is a vast area made up of wetlands, part of which also covers the Kalahari Desert in Botswana. As you canoe through the delta, you might get to see a hippopotamus snorting his way through the wetlands. You might also get to see a lion drinking water if you are lucky. But there is no fear that the animals will come close to you. You are protected by a natural labyrinth created by the waterways. There are several safari agencies which offer these canoe trips at the Okavango Delta. Like the majestic Victoria Falls, Lake Kariba is also created by the Zambezi River. The lake is one of the largest in the world, covering a vast area of 1.39 million acres in Zambia and Zimbabwe. 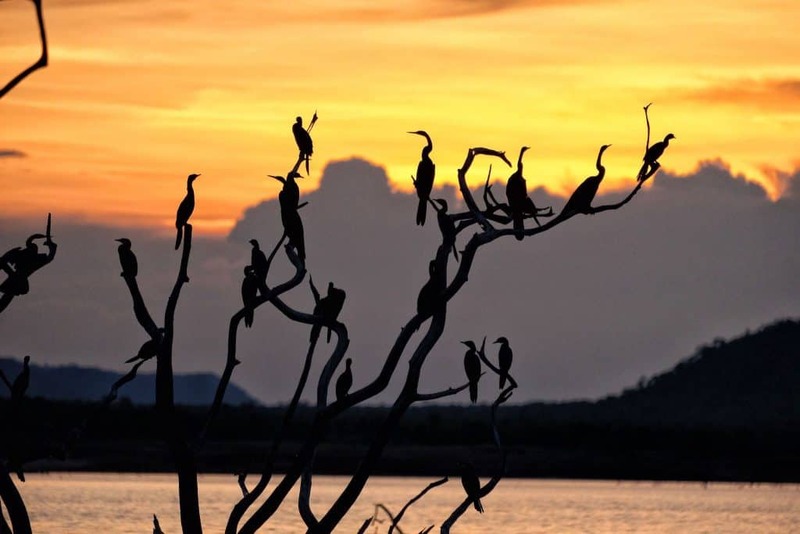 Lake Kariba is not only beautiful to look, at but it is also a source of livelihood for the locals. The dam produces hydroelectricity for both countries, whereas the waters provides for tourism, wildlife preservation and fishing. You can spend days at the lake watching the wildlife or the birds. You can also teach your kids some fishing while you are it. Going for a boat ride on the lake is another favorite activity. Guided tours of local wildlife are another popular choice for tourists. Yes, the name will stump you at first, but so will the beauty of the region. The Ngorongoro is a volcanic crater located at Crater Highlands. It was formed about 3 million years ago because of a massive volcanic eruption. Today, the crater is a major tourist attraction and is a hub for wildlife. An estimated 25,000 animals live inside the crater, which is 2000 feet deep! Interestingly, only one side of the crater receives decent rainfall and is covered with grasslands and trees. Popular animals living at the crater include elephants, buffaloes, gazelles, zebras, wildebeest and lions. The Victoria Falls can be truly described as grand and awe-inspiring. The falls are located at the border of Zimbabwe and Zambia. The local name of the falls translates to the ‘smoke that thunders’. Most of the time the Victoria Falls is covered with a watery mist created by the water coming down from such a great height. The thick column of water coming down onto the river can be seen from miles away during the monsoons. The falls, a UNESCO World Heritage Site, transforms the quiet Zambezi River into a ferocious one, cutting its way through deep gorges. There is nothing quite like going on a wildlife safari for the whole family. A safari at Tanzania offers plenty of excitement for people of all ages. You get to see animals like leopards, rhinos, buffaloes, elephants and lions at their natural habitat. These five animals are known as the ‘big five’ and are a big draw for the visiting tourists. Along with watching the animals, you can also go for camping in the wild. Adventure lovers can also opt for mountaineering and trekking on the picturesque snowcapped Kilimanjaro Mountain. Kilimanjaro is Africa’s highest peak, with a height of 5895 meters. The Abu Simbel Festival is one of the longest festivals in the world. It starts from 22nd February and goes on till 22nd October! Crowds come in from different parts of the world to catch all the action. One of the biggest attractions is seeing the ‘Abu Simbel Temple’ light up in various colors. The temple is dedicated to King Ramses II, who was a mighty Egyptian pharaoh. The temple dates back to 1224 BC and is revered greatly by the locals. The Kruger National Park is the biggest of its kind in the whole of Africa. It is located in the north-eastern region of South Africa covering an area of almost 20,000 kilometers. A wide variety of wildlife roams freely inside this park. The absence of fences and the surrounding private reserves has created a truly unique place for watching wildlife. The Kruger National Park is also famous for the ‘big five’ animals ­— leopards, rhinos, buffaloes, elephants and lions. But other than them, other sightings in the park include white rhinos, nearly 500 species of birds, 148 species of mammals, and 100 species of reptiles!